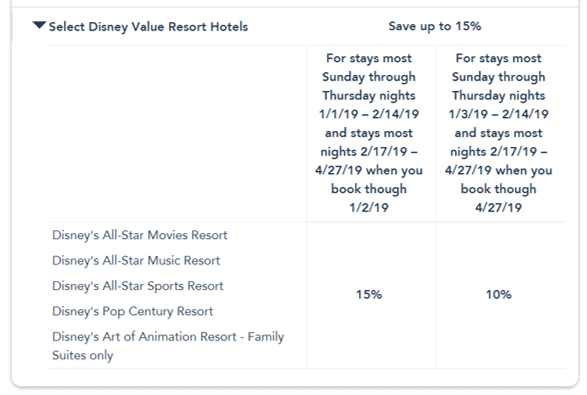 Several new Disney World deals for 2019 came out this morning, of which the two most important are a room rate deal (covered on this page) and a Play, Stay and Dine Offer which I will cover later. However, during the first period (until February 14) at the value and moderate resorts, only the Sunday-Thursday night parts of your trip will be discounted–you can still stay on Fridays and Saturdays, but with no discount. As always, there’s a limited inventory of rooms available, and not all resorts or room types are included. No resort is totally excluded, but at Art of Animation, as usual only Family Suites are included. Discounts are limited to Sunday through Thursday nights until 2/14, and are higher if you book by 1/2/2019. No moderates are excluded, but the deal is less valuable at Port Orleans Riverside and Port Orleans French Quarter. 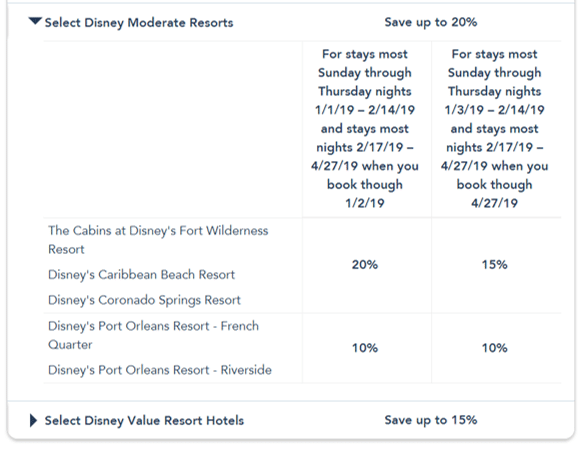 You’ll face the same patterns as at the value resorts–no discounts on Friday and Saturday nights through February 14, and better deals (except at the Port Orleans Resorts) if you book by January 2, 2019. 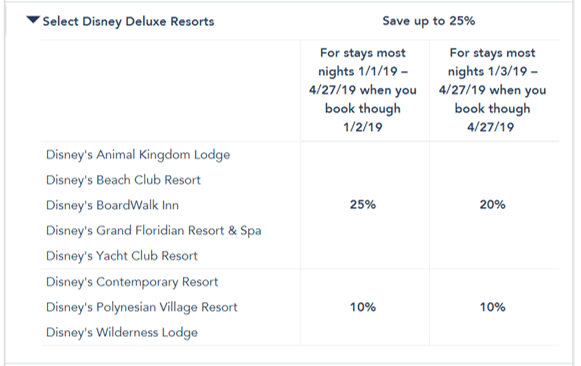 No deluxe is excluded, nor do they have Friday/Saturday night exclusions from the deal, but you will find not as good a discount at the Polynesian Village, Contemporary Resort, and Wilderness Lodge. Except at these three, discounts are better if you book by January 2. 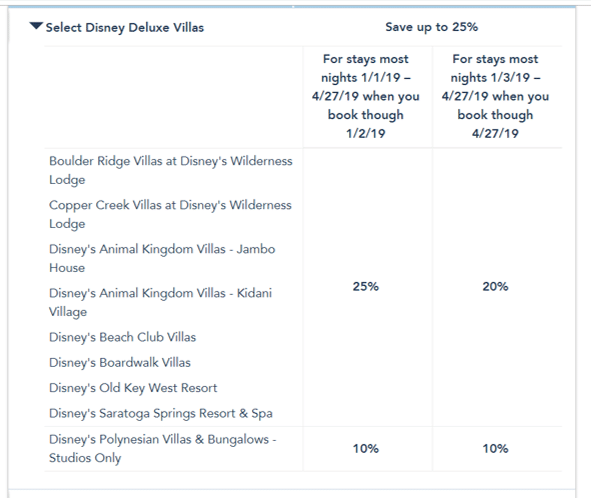 At the DVC resorts, the Villas at the Grand Floridian and Bay Lake Tower are excluded, and at the Polynesian Village, only the Studios are in the deal. Moreover, the Polynesian studios are at a lower discount. Like at the deluxes, there are no Friday/Saturday night exclusions from the deal. Except at the Polynesian, discounts are better if you book by January 2. Full reviews of each of the resort options begin here. 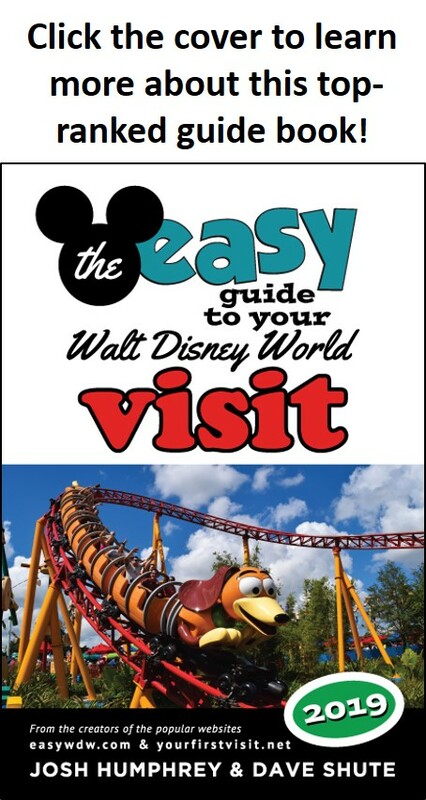 Disney World’s page on this deal is here. You can find the other deals that came out today here (scroll down to find the ones with a 2019 date).